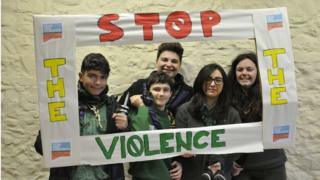 Girl Guides and Girl Scouts in 146 countries will enlist boys as part of a United Nations campaign against gender violence. The UN's 16 days of activism start on Friday and the World Association of Girl Guides and Girl Scouts (WAGGGS) wants its 10 million members to take part, campaigning in their own schools and colleges. Many girls "face violence and harassment on a daily basis", according to Nicola Grinstead, chairwoman of the association. "The severity of the issue is significant. For girls at school, "the fear of violence will stop many of them from reaching their full potential", said Ms Grinstead. and in Sri Lanka the guides are working with local government and in schools to get the message across. The UN campaign will last from November 25 International Day for the Elimination of Violence against Women until December 10 UN Human Rights Day. According to the UN, women across the world are subject to physical, sexual, psychological and economic violence, regardless of their income, age or education. less than 40% of these sought help - and only 10% went to the police. Ahead of the campaign, UN Secretary General Ban Ki-moon said: "Violence against women and girls is a human rights violation, public health pandemic and serious obstacle to sustainable development. It imposes large-scale costs on families, communities and economies. The world cannot afford to pay this price." A poll of more than 2,000 young people in 60 countries for WAGGGS suggests that more than half of girls are deterred them from studying or taking part in hobbies by the threat of sexual harassment. And too often the perpetrators are fellow students or teachers, the figures suggest. In the UK, MPs have called for action to tackle sexual harassment and violence in England's schools. And Girlguiding UK has launched a petition calling for "urgent action to end this widespread and often hidden scandal" in England, Scotland and Wales. The petition, from Girlguiding's advocate panel of women aged 14-25, warned of daily sexual harassment of girls at school.